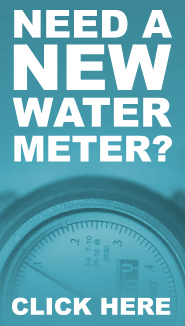 New water and wastewater service connections are installed by the customer* and maintained by Austin Water. Plans must be prepared by a Texas Licensed Professional Engineer and submitted to Austin Water for approval prior to installation. * Qualifying residential customers may be able to retain existing water and wastewater service connections, please contact the Austin Water Taps Office for details. 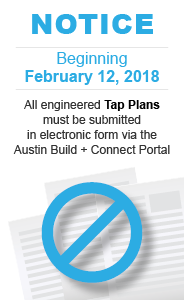 After Austin Water’s Taps Office has determined that new water and wastewater service connections are needed, you will need to submit an engineered tap plan to the TAP Plan Review Team. Customers with approved tap plans will be allowed to pay connection fees. No building permits will be issued until all tap fees have been paid. Once the plans have been approved, a right-of-way permit from the City of Austin’s Transportation Department must be obtained prior to the installation of service connections. In addition to new service connections, property owners are responsible for installing yard lines (water and wastewater pipes located between the property line and the building they serve). Engineered tap plans must meet local and state design requirements. All tap and site plans must be submitted using the checklists below.